Nic has now been using clay for almost 30 years. His first encounters with woodfiring began because he had no other way to fire his work. In his late teens and early twenties he began building kilns and wheels and sourcing his own clay from the local river banks. 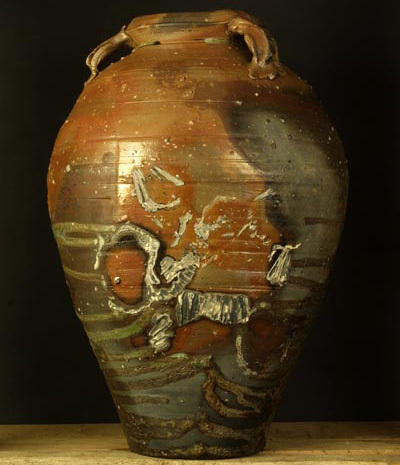 He experimented with raku, sawdust firings and saltglazing. After being self taught at throwing, Nic then went to Derby College of Art in 1985-86 and studied Studio Ceramics. After leaving Derby he worked briefly in potteries in Italy and Germany. In January 1988 Nic started his own workshop at Powdermills in the heart of Dartmoor. His first kiln there was an fast fire Olsen type kiln. In 1991 he built a large Anagama kiln in which to fire garden pots and domestic wares. At that time there were very few Anagama kilns in the UK. The only other was used by fellow potter, neighbour and friend Svend Bayer. Much experience was gained on both sides, through mutual firing help (between them up to ten firings per year). Since the early 90s Nic’s pots have dramatically changed, mainly due to influence from effects of the kiln. For example: when side stoking the Anagama inevitably pots would be knocked over , falling into the fire box areas and be buried in ash and ember. In the early days these pots would be discarded as failures, but now this type of pot is Nic’s goal ! Nic builds several kilns a year to suit changing pot styles and firing ideas. The alchemy of wood firing is still fascinating to Nic with each firing bringing fresh ideas for new pots and new kilns. An endless journey! Nic now works and lives with his partner Sabine in a converted barn in Moretonhampstead where Anagama kiln building and firing courses are run twice a year..
Moretonhampstead is situated at the edge of Dartmoor National Park and is known as the gateway to the moor, a stunning and inspiring area of Devon.